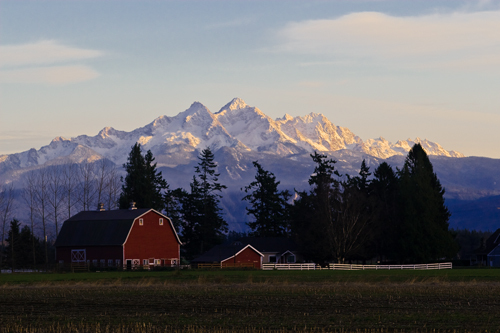 At just the right time (sun only a few degrees above horizon) I happen to be driving by this wonderful little scene south of Lynden, WA. Kinda has that Thomas Kinkade painting look doesn’t it… that’s the plan. Here is the way the shot looked before any work was done…. This entry was posted on November 24, 2008 at 11:08 AM	and is filed under fine art photography, Landscape Photography. 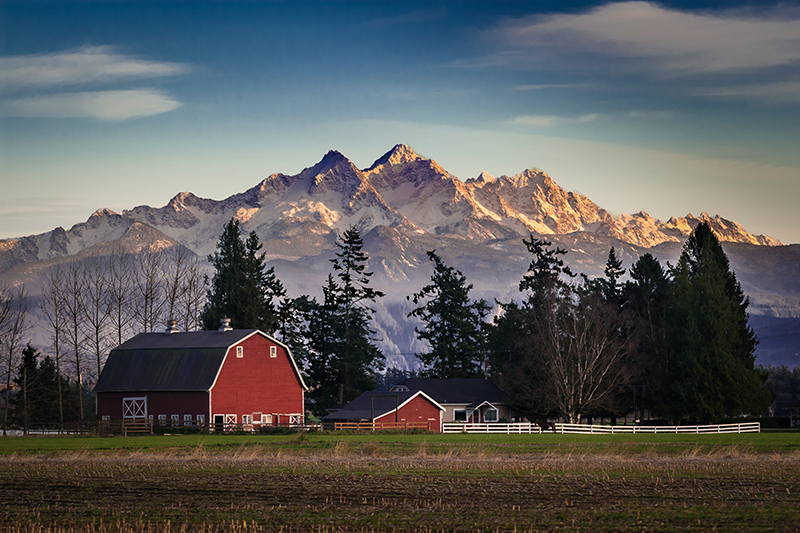 Tagged: fine art photography, Landscape Photography, seattle landscape photographer. You can follow any responses to this entry through the RSS 2.0 feed. You can leave a response, or trackback from your own site. Holy crap, Mike this is gorgeous! 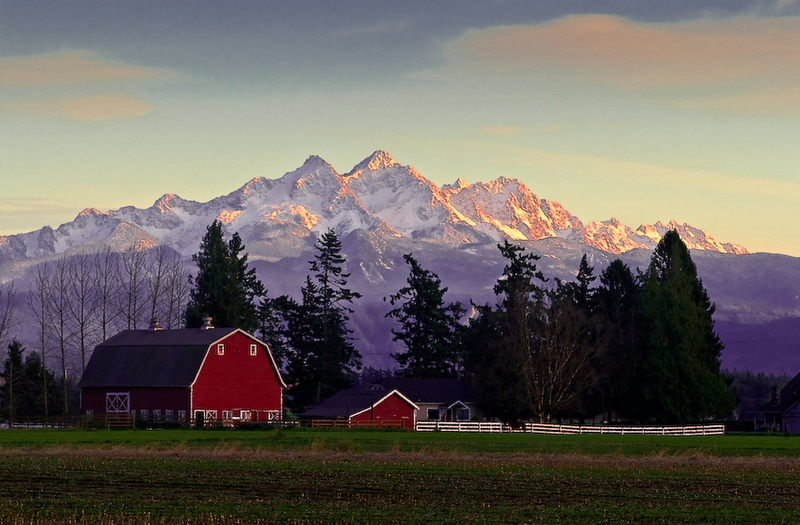 My sis in law lives in Lynden and I’ve seen several similar spots, but it’s never looked that fantastic when I’ve been there. What lens did you use on this? The particulars are ISO 200, set at minus.67 exposure, 1/500th at F5 with a 70 to 200mm lens set to 160mm on a Canon 30D. And then you have kind of a crappy photo which goes into LightRoom where the following process takes place (more or less). 2) Make 4 virtual copies. 3) Adjust each copy to meet you desired look in highlights, upper mid tones, lower mid tones, and shadows. 4) Open them to Photoshop in aligned layers. 5) Use layer masks to reveal the pieces you want to see in the final. 7) Flatten and work saturation, color, and density. 8) If Ok then size for output… This is 17.5 inches to fit on a 16 x 20 with a border. 9) Then split into layers… Sharpen the lower layer to 400 times at .8 pixels with a threshold of 1 or 2. 10) Adjust transparency of upper layer to reveal the proper amount of sharpening for the size print you are going to make. 11) Flatten and save… distribute as you wish. There are a few things I have left out because I use some presets in Lightroom for controlling the sky and augmenting the golden colors but they don’t always work…. And the final version here has also been worked over with paint daubs in Photoshop filters. Banding is a problem. Sometimes I cannot fix it and have to start over with the DNG file. Thanks for posting your specs and processing! Ahh, so the scene has never looked that good because it actually doesn’t to the naked eye. I process via ACR but often do the same thing with my images, layer masking several different exposures and tweaking contrast and saturation. Like Ansel Adams methods but without the nasty chemicals! Yes, it did look as good as you see it in the photo above… BUT you have to make the camera see it that way. Cameras, film or digital, can only see something in 2 dimensions, one slice of time at a time. And they can only see the whole scene at once… averaging it out… THAT is what makes it blah. You have to UNAVERAGE it to make it sing. Imagine an orchestra’s instruments all playing the the middle note of their range at once… This would just be noise, not music. So, I think cameras are the same kind of thing. By using lights, filters, lenses, and post capture processing (pulling the film, pushing the film, changing emulsions, changing gamma curves, burning, dodging, tricking the white balance computer, and rendering the photo one visual element at a time into one image) you can finally print your vision. Accepting things the way a rather primitive machine sees them would make photography worthless to me. And I know you agree because your work reflects your vision not the machine’s… that’s why people think you’re good at what you do. The photo itself is stunning in composition, color and depth. The mist effects on the foothills makes this photo particularly Kinkade like. Thanks for the correction. I was a little suspicious of my name because I could never make the point of view match the peak on a map… And the Sisters seemed too far south but distance is very hard to judge (for me anyway).